An Afghan refugee vendor waiting for customers at his stall of fruit on the road side at Pakistani border town Chaman, along with Afghanistan border on Wednesday, January 14, 2015. Photo by Matiullah Achakzai. Quetta: The farmer strikes at the land with his hoe, paving the surface into neat square patches to grow vegetables. His is yet another field in the land along the Sabzal Road in Quetta where farmers have increasingly taken to growing vegetables in a place dependent on greens from the neighboring Sindh and Punjab. Out here at Sabzal Road , the vast vegetable fields along the road are a rare sight in the bone-dry Balochistan because they are properly irrigated. In absence of rain and irrigation water, the growers at Sabzal Road have hit upon the idea to use sewage water to irrigate their fields. In an open sewage drain that leads up to the Sabzal Road, one can see solid waste from the city hospitals and houses, flowing towards the low lying areas of Quetta valley. “We are not irrigating the land with dirty water,” says a farmer at the Sabzal Road who didn’t want to be named. And yet, ask anyone in the city and they would tell you that the Sabazal and Spini road are where growers irrigate their lands with sewage water. The vegetables grown here go to Quetta where they are sold, among other locations, at the city’s Sabzi Mandi or vegetable market. The sewage water from the city is openly used to grow different kinds of vegetables but growers decline to comment on why they are using polluted water known to cause serious health problems such as liver disease. In Quetta, vegetables grown at Sabzal and Spini roads is sold in different markets but vegetable vendors deny this. “We bring our vegetables from Sibi because we know that the vegetable grown in Quetta is cultivated with dirty water,” says Mohammed Ali, a vegetable vendor at the Joint Road. Mohammad Alamgir Khan, another vegetable-seller in the city said nobody was ready to tell the truth to buyers in the Quetta’s market. 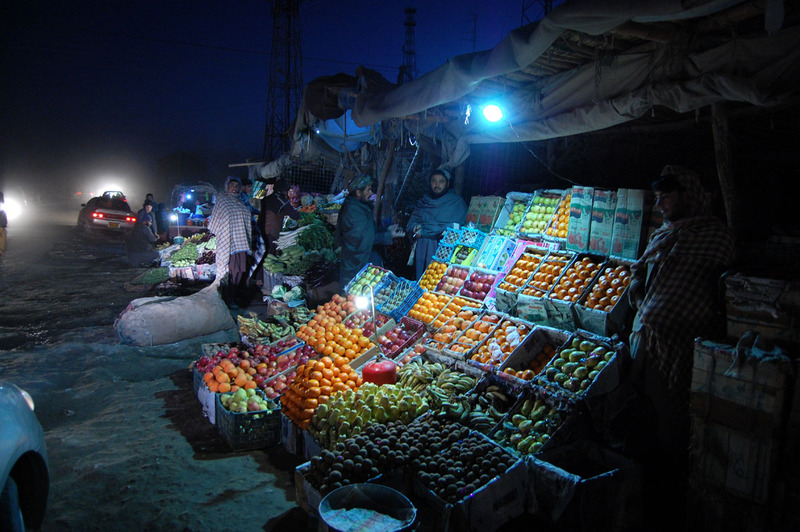 “We are making more profit from Quetta’s market because we don’t have to pay freight charges incurred by vegetables transported from other provinces,” he said. Not a single shopkeeper or vendor agreed to bringing vegetables from vegetable fields around Quetta since it is widely known that growers irrigate their lands in Quetta with sewage water. Talking to News Lens, Dr. Sharbat Khan said Hepatitis B and C were very common in Quetta and other parts of Balochistan. Director Environment Protection Agency (EPA) Balochistan, Sahib Khan, said the use of contaminated water to grow vegetables was really injurious to health: “There are 38 hospitals in Quetta with no solid waste disposal systems in place. The waste gets mixed with the sewage water which is used for irrigating the land in Quetta. He said the government was planning to build a sewage line across the city which would help improve the situation.